Locations: Selkirk, Altoona, Cresson, MG Tower, Horseshoe Curve, Hudson River, Gallitzin, Lewistown, Reading, Secaucus, Ridgeway Jct., Cleveland, Buffalo, and more..
Sources: Tim Hosey (96-97), Jack Kuiphoff (76-78), Tom Luckey (88-92). Charles Smiley Presents programs are modern classics. Most important are the high quality films. Digital processing assures us of the best possible image from the source tape. Synchronized sound, and a natural sounding environment, bring the trains to life. Attention is brought, to a wealth of historical information. Often, he has intriguing information of a railroads inner workings. Judicious use of his custom-made maps, keep viewer awareness of: location, elevation, routes and direction. Smart and effective narration holds the many elements together. On-screen graphics offer even more information. Extended program lengths . More costly to produce, the glass mastered DVD’s are of highest quality. The many bonus extras add additional value to the shows. 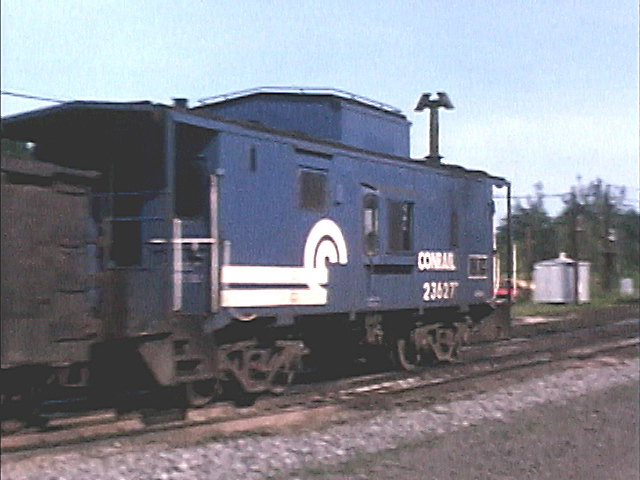 Conrail 2973 is a General Electric U36B. This is a former Auto Train locomotive. A scenic area is at MG Tower, as depicted on the map, a highlight segment of the program. Maps are plentiful and frequently referenced, to keep viewers well informed. Focusing on a much-needed Conrail history, this one fills a considerable gap in American train videos. 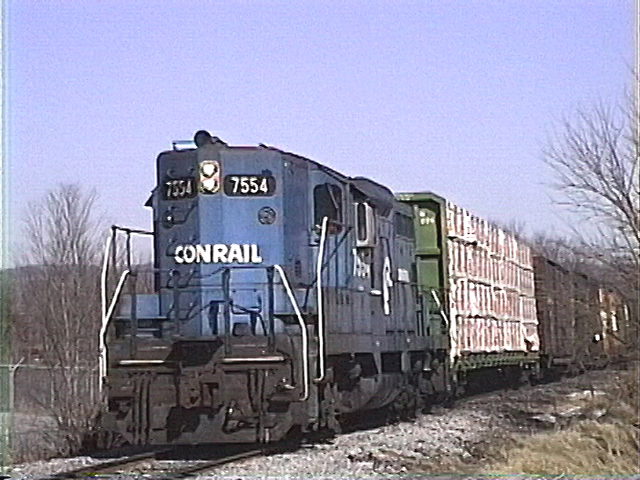 There are many Conrail videos available. This one has the major advantage of including a complete look at this huge railroad. The time span alone, makes the price of admission a bargain.The value of having it on a Charles Smiley Presents is… priceless! At nearly 2 1/2 hours, there is way too much material to cover in detail, within this review. This is an extremely comprehensive show. The three sources cover the showcased years with excellent cinematography. There is so much to see in this show. Example: Only CSP would take the time to include a segment of Delaware & Hudson on a Conrail show! Mainly filmed in Pennsylvania. We also have plenty of scenes in New York, and New Jersey. Even more, Indiana and Ohio. There is a chapter menu and a few nice previews. As we progress through the Conrail story, Charles reviews the history of the four CEO’s. Each one, had to deal with an always evolving railroad climate. His winning formula is much like a PBS broadcast program. 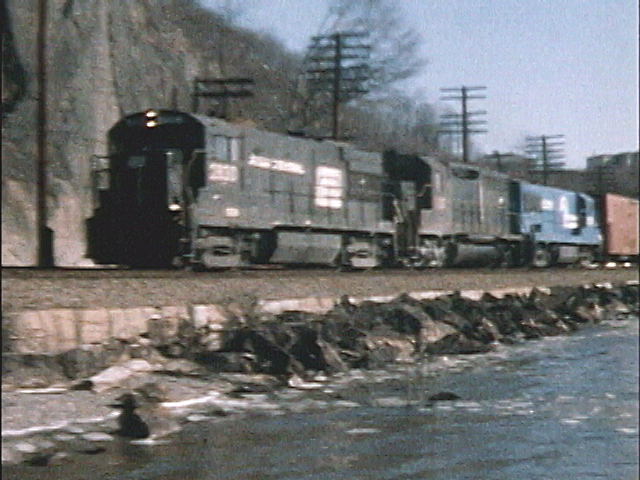 As a recent railroad overall, the historical aspects begin in the 1960’s. Additional historical material is included of course! Charles has a fantastic viewing and an intelligent discussion on early Conrail. All of the merger roads have some locomotives to witness. Many, with hastily applied CR renumber, painted over original logos, the 1976 era version is patchwork city! Wild combinations of any road, any builder, make it impossible to guess what will be next. 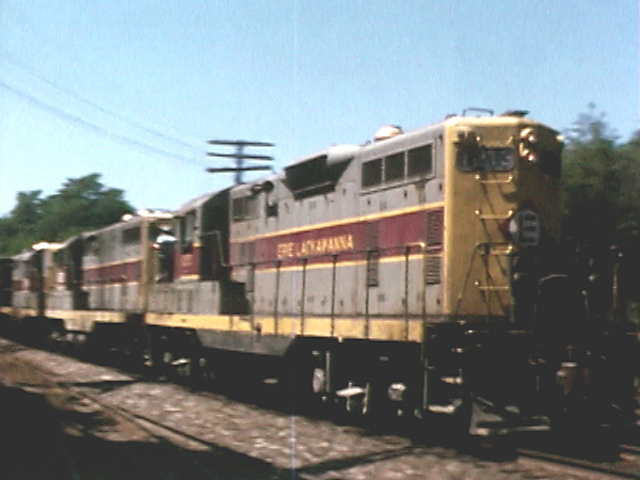 This Erie Lackawanna power is from 1976! 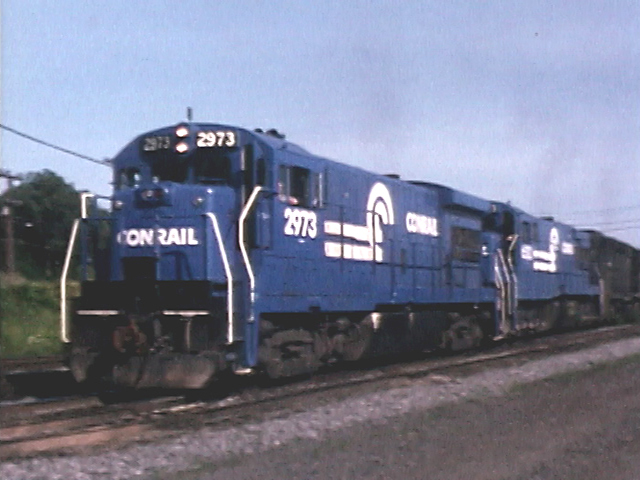 The early Conrail years have extensive coverage. It is engaging to watch the cornucopia of merger partners locomotive lash-ups. Alco still had a presence at that time. Big engines like the C630 pulling upgrade on Horseshoe Curve in 1978 are legendary to railfans. The screenshots speak here. Conrail had some major rebuilding programs, of it’s inherited power. 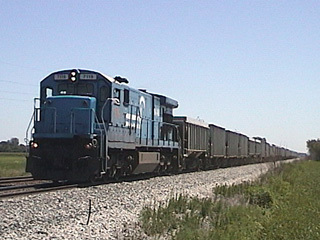 Viewed in active service, former New York Central GP9, is now a GP10. This was one of those rebuilds, seen here. 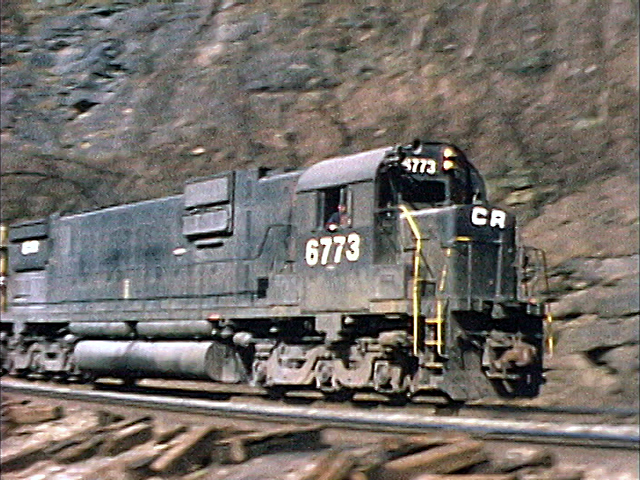 The camera follows this engine, with a local freight in Pennsylvania. Plenty of General Electric built diesels, in original owner, and repainted Conrail schemes. 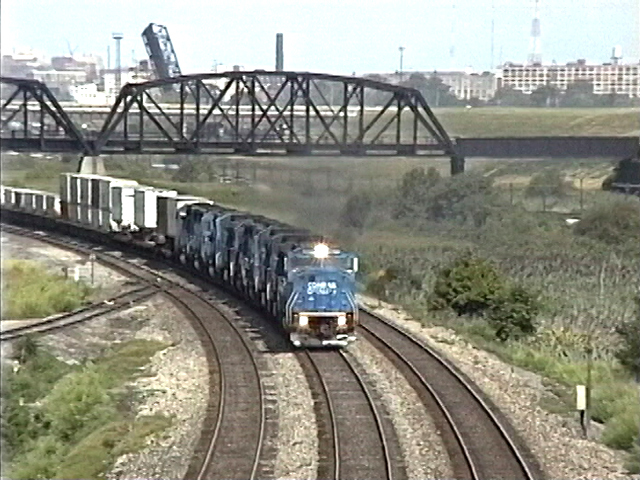 Conrail continues to modernize and proceeds to be a success. The 1980’s show how the road has made progress. 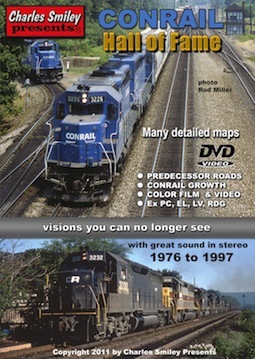 The 1988-1992 footage documents the improved railroad. The 1990’s see the release of third generation power. Foreign locomotives are not uncommon. Run through engines in Conrail territory. will sometimes appear. BNSF, CNW, CN and GT are some of what goes blasting by the camera. Lots of live audio and just plain fun trainwatching! Even in this late era, there is enough variety to keep us guessing. The years of 1996- 1997 show the final years.This was the ultimate, modern Conrail, before its subsequent break-up. A fine look at a great railroad. Once again, Charles Smiley has outdone his biggest competitor… himself! An instant classic, Conrail Hall of Fame is the definitive work on the railroad. Action packed film, with the best coverage of: start-up to conclusion, in a single program. Everyone will enjoy this show. Even the kids will find the multitude of live action sequences a ton of fun! If you have never viewed a Charles Smiley Presents, this is a great one, to get onboard. If you have viewed a Charles Smiley Presents, this one is just as outstanding, as the rest. Conrail Hall of Fame is a comprehensive release. Railfans and model railroaders will find this show to be informative and enjoyable. This is a must have for Eastern railroaders. This entry was posted in ATVR Reviews, Charles Smiley Presents and tagged American Train Video Reviews, Chicago railroad, Conrail, Erie Lackawanna, new releases, Penn Central, Pennsylvania, Railroad, Train DVD, train video reviews, transportation by William J. Hudson. Bookmark the permalink.